It is the story of a man and his dog, but do not expect Lassie from provocateur Quentin Dupieux, a.k.a. Mr. Oizo. 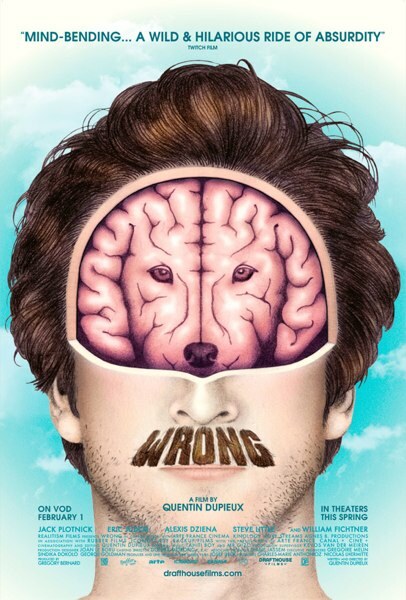 He cast off all logic-based constraints and was creatively liberated for it, to judge by the distinctively strange results in Wrong (trailer here), which opened today in New York. Dolph Springer’s dog Paul has mysteriously vanished. His neighbor is less than sympathetic, because he is too busy going mad. He is not the only one. Eventually, it seems Paul was kidnapped by Master Chang, a tripped out New Age guru, for reasons that defy conventional reason, but make perfect sense in this world. Springer’s gardener, a pizzeria girl, and a detective also careen in and out of the film, in ways that cannot be explained in a lucid thumbnail description. In his somewhat notorious Rubber (the killer tire movie), Dupieux came up with an eccentric premise and a clever twist, but seemed too hemmed in by the circumstances he created. In contrast, throughout Wrong he allows anything to happen, whether it makes objective sense or not. The resulting absurdity is quite entertaining to behold. 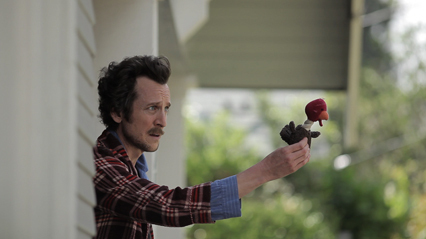 Jack Plotnick is a heck of a good sport. For Wrong to work, he has to play it all relatively straight, while everyone else acts insane. In fact, he brings an earnest sincerity to Springer that is rather endearing. Prison Break’s William Fichtner clearly enjoys hamming up Master Chang’s wacked out Zen, while Alexis Dziena plays Emma from the pizza shop appropriately over-the-top, like a sweetly innocent version of Fatal Attraction’s Alex Forrest. Wrong is stylistically surreal and subversive, but rather gentle in tone, which is why it works so well. Unlike David Lynch’s Lost Highway, it never leaves viewers bereft of faith or hope. Indeed, Springer is sort of an everyman model of stick-to-itiveness that is actually sort of refreshing. Rife with postmodern gamesmanship and goofy sight gags, Wrong is definitely aimed at a hipster audience, but it goes down way easier than one might expect. It is a funny, good natured film, recommended for the only somewhat adventurous as well as their more surreally inclined brethren. It is now playing in New York at the Cinema Village.